Tonight was the first class of this trip. Selfishly I was hoping for a very small group and we were already around 30, it seems that fear is going away. It was nice to meet my buyu and the Japanese Shihan again, but most important it was nice to see sensei and to train with him. He was in a great mood and I often question if he is really 81 years old as he moves like a young man. What did we do tonight? After I demonstrated a kind of musha + omote, sensei used it to apply many different omote, ura, musha and musô to his poor uke ending always by pressuring one or more fingers at the nail level. “this is the way yo control in the Takagi Yôshin ryû”. The general idea is not to do a technique but mainly to react freely to the flow of the opponent until he gives you one or more fingers that you use to pin him down with a lot of pain. Then Pedro did a very interesting mix of half-cooked movements trapping uke in his mind in such a way that exploding to the floor seemed to be the only logical solution. Uke attacks with a right Tsuki, you deflect it softly with your right hand by walking to the right (inside – ura); uke reacts to that and you begin an omote gyaku that transforms itself into an ura gyaku when goes to the ground in pain (quite similar to the omote-ura gayku of the gyokko ryû). Very nice piece of Taijutsu by Pedro that many in the dôjô had a hard time too understand and to do. From there sensei used the start of this half-cooked technique to develop once again on the “chutô hanpa”. He did like a dozen variations on this on one tsuki double tsuki, with two uke, etc. Finally he did it with the sword in Uke’s belt (daisho sabaki technique) explaining a few times that the Tsuka, or the saya is going itself into the hand. “Don’t try yo grab it, it comes naturally into your hand”. Sensei stressed the importance in all the techniques to use the “karada” body instead of using the hand and the head. We can summarize that with the sentence: “don’t think or grab, don’t use power, walk”. At the end of the class we did a biken technique similar to the kukishinden ryû Tsuki komi np sayu gyaku. Uke attacks daijodan and tori move lightly and slowly to position the kissaki on the left wrist of uke. If uke tries to cut dô kiri, then tori’s sword rotates around the point of contact and deflect the blade naturally, tori lift his sword and hit (not cut) the right wrist with the power of the legs bending. Sensei insisted a lot on not cutting uke: “it is simple to cut, it is much more difficult to control uke without cutting him”. The secret is to move slowly with the body; Sensei added that what is common sense to sport budô (gendai budô and MMA styles) is uncommon sense to us. Fighting is not about power and speed it is about softness and slowliness. We did many variations around this theme absorbing backwards while moving forward, giving uke a wrong sense of distance as explained by Nakadai sensei. The class went fast like in a dream and it was already time for the sakki test. The bujinkan is richer by 2 shidôshi: Pedro did the sakki test on an Australian guy and I did it on a Swedish one. Speaking of which, Christian Appelt who tested heavy pain tonight under sensei was promoted to Jugodan, congratulations! After the class sensei spoke to a group of jugodan and insisted once again upon the importance of jugodan working together and keeping the connection between us all. It reminded me of the “en no kirinai” studied last year. He also spoke about the new book he is working on, called “ninja daizen” (I’m not sure about the title) that will expose many new things about ninjutsu (sensei spoke of ninja in Kyushu during the Edo period). He added that ninjutsu was not limited to the sole Iga and Koga clans… I guess we will have to wait for the book to be published to know more about that. If you should have been here tonight and didn’t come: too bad for you! 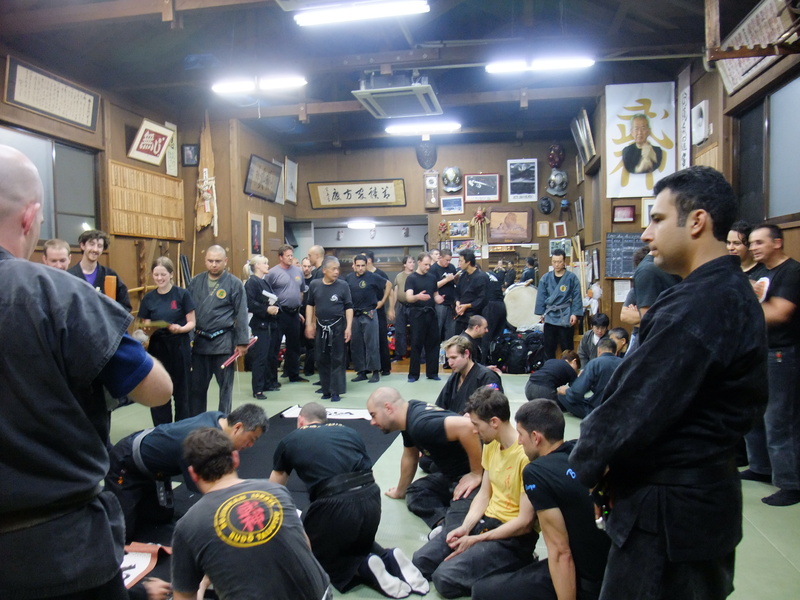 The bujinkan is still alive and the many people coming from all over the world were there to prove it. Sensei and all the shihan are in good health and life is back to normal (too bad you didn’t come). Today: no earthquake, no tsunami, no radioactive cloud, but a very good class (too bad you were not there). 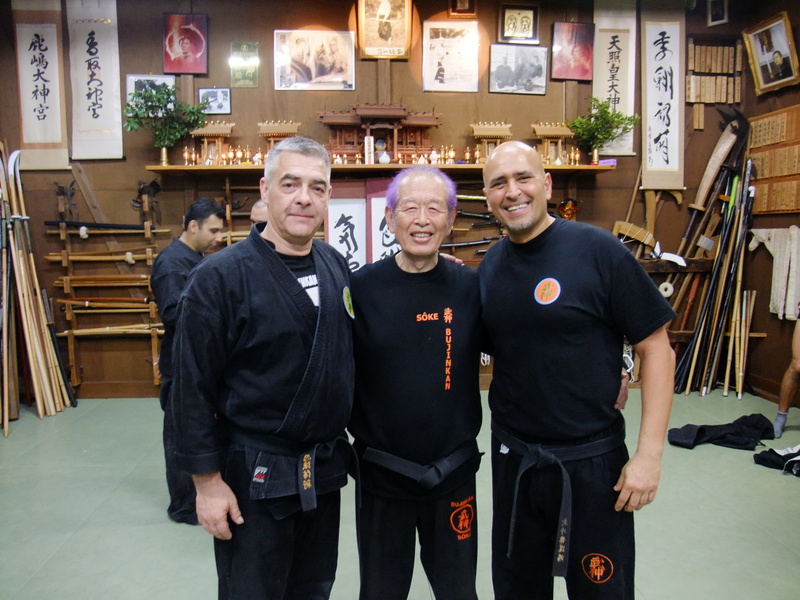 Tomorrow two classes: Senô sensei and Oguri sensei (yes he is back on Saturdays). I keep you updated.